You are here: Home / Featured / The Amazing Spider-Man #9 Review! Spider-Verse Event Begins! The Amazing Spider-Man #9 Review! Spider-Verse Event Begins! 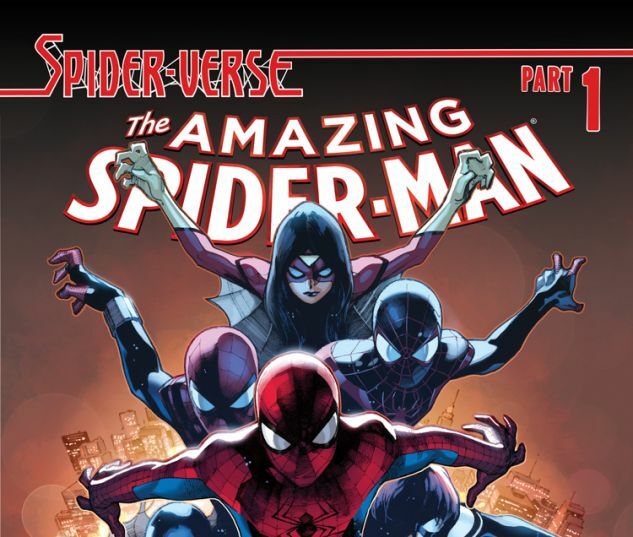 We’ve been to the edge, but this week Spider-Verse finally kicks off in Amazing Spider-Man #9. Promised as “the biggest spider-event in history” and containing “every Spider-Man ever,” this story has a lot to live up to. And it quite literally is big; this issue is a 36-pager with no ads, save a Marvel promotional fold-out. This issue is mostly exposition as all the other Spider-Men and Women that have previously appeared in Edge of Spider-Verse all converge on Earth-616. They’ve all been drawn there, along with other Spider-Family heroes like Spider-Woman, and they spend most of the story getting our Peter Parker up to speed on the situation. We also learn that Morlun has been avoiding Earth-616 because of the beatings he has previously received there. A lot of information about the Inheritors is finally revealed in this issue, and a few more mysteries are seeded too. It’s a pretty standard Dan Slott script, but epic in scale with lots of jokes in both the dialogue and in the captions. Even though not much happens action-wise in this issue, Slott still manages to write a very entertaining story. We are introduced and/or re-introduced to many of the various Spider-Folks, and I think it’s important to point out that you could read this issue without having read any of the Edge of tie-ins and not be completely lost. This really does serve as the beginning of the main story, though I’m glad I’ve read the tie-ins because it makes reading the book a richer experience. The answer: all the Spider-Mans. Ever. The art by Olivier Coipel is fantastic in this book. Everything looks great and I love his highly detailed style. He’s also able to give each version of Peter a distinct look, even beyond the costume differences, that makes it very easy to tell all the Spider-Men (Spider-Mans?) apart. His poses are dynamic, the action is exciting to look at, and the colors by Justin Ponsor push the visuals over the top. There’s also a wonderful two-page spread in the epilogue, drawn by Giuseppe Camuncoli, showing the Web of Destiny that gives tiny peeks at even more versions of Spider-Man. There are a lot of Easter Eggs hidden within the web over both pages that will reward sharp-eyed fans. Slott has been building to this for months, and frankly, the book does not disappoint. It’s very easy to get tired of big events like this now, but there’s something intriguing about Spider-Verse. We all know that “the real Peter Parker” is most likely going to make it out of this crisis intact. But what Slott is doing here is not just threatening the status quo of Spider-Man or the Marvel Universe or even the Multiverse, he is threatening every version of Spider-Man from every medium. There is the very real possibility that the Peter Parker from the 60s cartoon show could be killed, for example, and it would at least feel like it counted. It’s a masterful illusion that Slott is weaving; it’s not like the episodes of the show would suddenly go away, but it will still affect the overarching meta-fiction of Spider-Man. If you’re a fan of Spider-Man at all, you should read this comic. This whole thing could turn sour at any moment, but, at least for one issue, I’m certainly entertained.